We made comic books from 2001 to 2004. 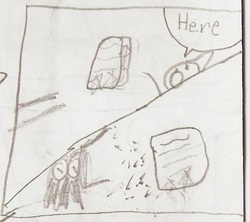 We called them Clipboard Comics, because the first comic was made on a clipboard. We called our production company Playground Pond Inc. back then. The Playground Pond Inc. logo appears on the back cover of each comic. We kept no records of the dates that we made the comics, but have inferred through the magical power of logic that a majority we made between late 2001 and mid 2002. Apparently, the production started slow, then sped up to a break neck speed, and slowly began tapering. 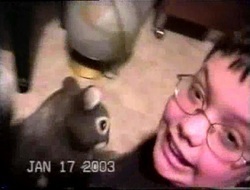 In 2002, we got our first video camera. In early 2003, we were suddenly struck with the idea of making a movie based on our comics. Although it has virtually nothing to do with Clipboard Comics, it does capture the insane, improvised mania and ineptitude. It also captures the same basic structure of short segments (usually parodies) compiled together. Playground Pond Inc. was the name of our "production" company ever since we made our first comic. It was named after a faux club-type-thing we had created, which had a clubhouse (the room that became our comic studio), a buried treasure (a 1920's North Carolina license plate), and even a flag made out of an out towel and a sharpie. We planned on making a massive amount of movies, but only managed two before we were sued for possession of our camera by a guy named Batman. Seriously. At the end of 2004, we got a new camera and continued making movies under the title until early 2006, when we switched our name to "Webbed Toe / Mallard Brothers." 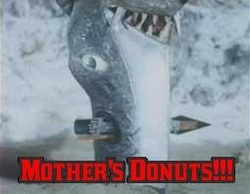 For the most part, all the movies produced as PPI were filmed in script order, and bloopers were filmed over. We did this because we had no possible way to edit the films. The old masters of many of these movies are on VHS-Cs. 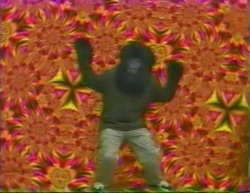 For some bizarre reason, 2005 marked a time when we realized how to properly use AV equipment. One of our supposed "discoveries" was how to completely re-dub the audio of a movie. Soon, we were re-dubbing movies in a distinct, horribly unwatchable style now known as "Audio Trickery." 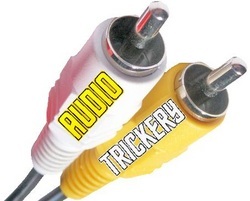 The act of "Audio Trickery" creates an "Audiotrick." Audiotricks involved the two of us watching a film while improvising all the dialogue, sound effects, and plot. Usually, we would be accompanied by random background music playing on shuffle. Most Audiotricks are incredibly difficult to watch, but incredibly funny, as they offer a 90 minute, forced stream of consciousness. In 2010, or maybe early 2011, we recorded our 42nd Audiotrick and called it quits in favor of Quack Attack Riffs. We changed our production name in 2006 to "Webbed Toe / Mallard Brothers." This marked a distinct change in direction. Up until this point, most of our films were incredibly sloppy, edited during filming, and parts of large compilations of parodies. Under our new title, we began writing original stories, and editing them after filming. We were quite awful at the editing, since it relied on a complex network of VCRs and DVD recorders. Either way, it helped us learn. Eventually, we dropped the "Webbed Toe" part of our name in favor of a simpler "Mallard Brothers." This happened around 2009, when we finally began to use editing software. Simultaneously, our camera stopped working, halting any filming. During 2005, we bought an old tape recorder and began using it to make mix tapes out of music and quotes from television, video games, and movies. With our new found ability in audio recording, we considered making a "soundtrack based on our movies." However, it wasn't until 2007 that anything materialized. In 2008, we made our first actual "album" using the mix tapes of obscure music that we had created before. A majority of the humor comes from our distinct and jarring lack of musical talent. 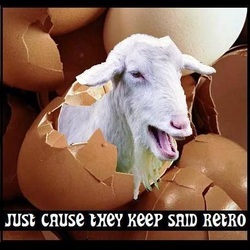 Although, some gems have been created, most of our songs are quite tongue-in-cheek awful. After the first album, we adopted the name "Cellular Moshpit" -- a reference to a riff we made on Spiderman 3 when we first saw it. 2008 marked the time that we finally got video editing software. As a result, the two of us created independent YouTube channels, which later evolved into websites of their own. First to have a channel and website was Alex, with Quacksilver Films. Quacksilver Films explores film-making, animation, and other video techniques. 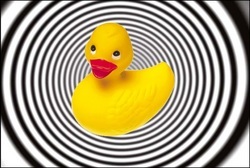 In early 2011, Andrew abandoned his Youtube channel and created a website of his own, modeled after Quacksilver. 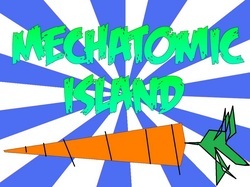 Initially, it was called 'Grimatomic Productions' but later changed to MechAtomic Island Productions. All content on this site © 2001-2011 Alex and Andrew Mallard, unless otherwise noted.